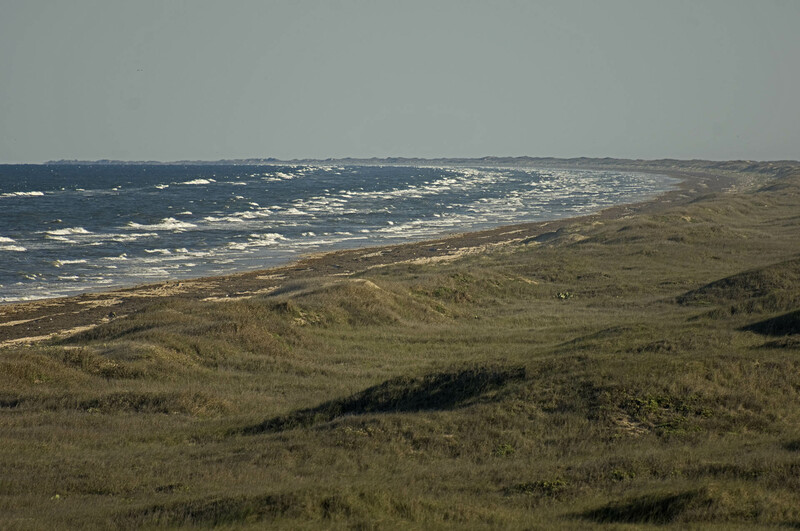 The Devil’s Elbow: Just about as far as one can get from anywhere in Texas, this is the big bend in the coast on Padre Island, 35 miles of four-wheel drive beach from the end of pavement. It’s hard to imagine that this beach will disappear because of abrupt sea level rise, but it is after all, only sand. This is anything that either reduces our annual emissions, or removes already emitted CO2 resident in our sky. So 80 Gt (gigatons) of negative emissions is equal to the complete cessation of CO2 emissions by man of 40 Gt per year, plus removing another 40 Gt CO2 from our atmosphere through some technique like direct air capture, reforestation, agricultural techniques, ocean fertilization, etc. In 1990, when it was expected that we would begin immediate CO2 emissions reductions, the rationale for 2 degrees C warming was developed, but it’s the one-degree C limit that we should focus oup[on (and should have focused upon in 1990.) “Beyond 1.0 °C may elicit rapid, unpredictable, and non-linear responses that could lead to extensive ecosystem damage.” This describes abrupt changes that are up to 100 time more extreme and 100 years faster than previously projected (see here.) The imitations of abrupt changes for collapse of the West Antarctic Ice Sheet, Gulf Stream and high altitude coniferous forests have begun. Very importantly for the limits of dangerous climate change: abrupt changes are not included in IPCC work because they are not yet modelable to the extent required by the climate consensus. Prehistoric evidence is not considered bcause it is not verifiable in our current climate through modeling. So abrupt change is simply not a part of current climate consensus or the policy upon which it is based. But the dangerous limits to climate change were created based on abrupt changes. And these limits were defined based on evidence from the past, when it was expected that we would begin emissions reductions immediately. PgC is Picograms carbon or the same as Gigatons carbon; 1 Gigaton carbon is equal to 3.667 Gigatons CO2. 1) (Top) … Orange dots — business as usual with 2% annual emissions growth and 4,660 Gigatons CO2 removal by 2100. The temperature rises nearly another degree and stays there beyond 2200. 2) Yellow dots — constant emission, no change from today. 1,243 Gigatons CO2 removal by 2100. The temperature rises nearly another degree and stays there beyond 2200. 3) Yellow line — constant emissions, no change from today. 2,550 Gtons CO2 removal by 2100. The temperature falls back to where it is today by 2100. 4) Green line — 3% annual emissions reductions. 870 Gigatons CO2 removal by 2100. The temperature falls back to where it is today by 2100. 5) (Bottom) Blue line — 6% annual emissions reductions. 560 Gigatons CO2 removal by 2100. The temperature falls back to where it is today by 2100. Holocene Maximum — the gray shaded bar: this represents the maximum temperature achieved about 5,000 to 6,000 years ago that is about 0.3 to 0.7 C above the preindustrial earth temperature about 250 years ago. My summary as it relates to the goal of a healthy climate: The scenarios presented by Hansen achieve a stabilization of earth’s temperature from about what it is today at 1 degrees C or 350 ppm CO2, all overshoot or continue to increase to near 1.5 C by 2050 to 2060 before falling back to 1 C by 2100. This “overshoot” is simply additional warming because our climate is not at equilibrium. In other words our emissions are out ahead of temperature. The oceans are still cooling the atmosphere. The three more aggressive scenarios (yellow, green and blue lines) that appear as likely scenarios today with strong decarbonization already appearing because of cheap solar and wind, include atmospheric carbon dioxide reduction of about 6 Gt (blue), 10 Gt (green), and 32 Gt (yellow) per year– in addition to the complete cessation of all fossil fuel emissions. These large negative emissions, in addition to the complete cessation of all fossil fuel emission, would still allow our temperature to almost double from the 0.69 C warming of just 2014. Because the abrupt change initiations we are seeing today have been building for years, we must assume then that even 0.69 degrees C of warming is far too much. Hansen and his exceptional team have done some very good work that gives us more confidence that we are on the right track with very large negative emissions. A target of 100 or more Gt negative emissions on top of fossil fuel emissions cessation, or simply 140 Gt negative emissions for just 10 or 20 years is what is needed to return warming to zero and reverse abrupt change initiations. This is less than twice what Hansen is suggesting, yet it reduces warming to zero, whereas Hansen’s 80 Gt negative emissions only returns the overshoot back to today’s temperature. Because CO2 stays in our atmosphere for hundreds to literally 10,000 years, so does the warming. Because of abrupt change initiation, it is critical that we reduce warming, not allow overshoot.